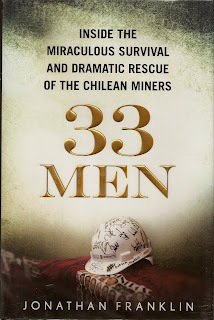 On the morning of August 5th, 2010 thirty three men went to work in the San Jose Copper Mine in Copiapo, Chile. It was to be a 12 hour shift, an ordinary day in the mine, working one day on and one day off. Within a few hours that day would be extended for 69 days after the mine collapsed, trapping the entire workforce of 33 miners, who became known the world over as "Los 33", almost 2,000 feet below the surface, with much doubt about how they would be, or if they could be, rescued. For the first seventeen days the world waited with bated breath for any signs of life beyond the massive 700,000 ton boulder which had sealed off the shaft to the mine. Experts from all over the world converged on the town of Copiapo, thrusting it into the world's spotlight for the first time. If you think you got the whole story of this event watching the news, you're wrong. Some of the infighting between the trapped miners and the rescuers on the surface was never revealed at the time. The lead pyschiatrist, Dr. Iturra, attempted to exert so much control over the men, going so far as to read the letters going back and forth between the miners and their families, and even censoring them, that at one point the men went on a hunger strike! Physicians from NASA, as well as the U.S. Navy, were brought in to deal with the prolonged period of isolation which the miners were enduring. No one knows as much about isolation, and what it does to groups of people, as do these two groups. NASA sends people into earth orbit for months at a time, while the Navy does the same thing beneath the sea in submarines. Their expertise was invaluable in dealing with the mental health of the trapped miners. At times engaging, and even humorous, you will be amazed at what went on down below the surface, as well as the wrangling for control that was taking place on the surface. Three palns were put into effect, using machines form all over the world to drill several rescue shafts. It became like a race to see whether Plan A, Plan B or Plan C, (these were the actual names of the operations) would reach the men first. The setbacks will have you just as concerned here in the book as they did when they occurred. The daily rituals that the miners had in place to keep sane are of great interest, as is the methods they were forced to improvise in storing bodily wastes. The book leaves no subject unexplored. Police sent down cameras and instructions for the men to film certain portions of the mine for use in the eventual investigation, and prosecution, of the mine owners. The mine had been a hazard for many years, with numerous violations. A quick read, and surely not the last book which will be written on this subject, the author does a credible job of taking the reader behind the headlines, to where the real story takes place.